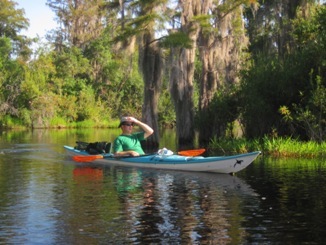 Folkston, GA--Most of the overnight canoe trails in the Okefenokee had been closed due to the fire and drought, but the refuge did open trails to Coffee Bay, Canal Run Shelter, Round Top, and Mixon’s Hammock. None of these were appealing except Round Top. In addition, reservations could only be made two weeks in advance. It appeared that the Fellow Travelers’ annual swamp trip would just not happen. In early October the refuge announced that the trails to Bluff Lake and Monkey Lake would be available. 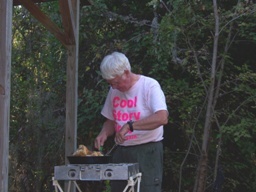 A reservation was called in for Monkey Lake for October 19, 2012, and the plans were hurriedly put together. Greg Baker, Art Shelfer, Sam Brown, and Brown Moseley all made arrangements to spend the night in Mr. Patel’s Folkston Western Motel for Thursday night. Joe Marshall, the rookie of the trip, decided to drive from St. Simons on Friday morning. Greg and Charlie arrived in time to eat a good meal at the Okefenokee Cafe, but Sam and Art had to settle for a Burger King in McClenny. Brown Moseley had some difficulty getting his truck out of the body shop so he arrived around ten at night. Everyone except Joe went to the Suwannee Canal Recreation for put-in. The reservation had mistakenly been written for Coffee Bay but that was just not suitable. 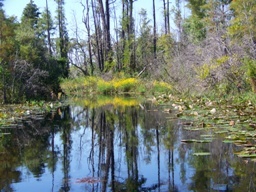 It is just five miles straight down the Suwannee canal and it the least interesting trip in the entire swamp. The refuge lady was very helpful and changed the permit and allowed the permit for Monkey Lake. The five then went to the ramp and began unloading the boats and packing them with gear. There was still no word from Joe. Once the boats were ready Joe did call and tell the group that he was ru nning late. Everyone waited patiently for his arrival. He had planned to bring his son alone but was unable to do so. When he arrived and packed his boat the trip was ready to be made. Greg brought his Bell Magic solo, Art and Sam paired up in the Canadienne, Brown used his kayak, and Joe brought his bright blue and white kayak. Charlie soloed in his Prism. The trip began with the initial run down the Suwannee Canal to the turn off toward Grand Prairie and Monkey Lake. It had rained Thursday night but the weather looked ideal for paddling. The water levels were sufficient for easy paddling. Not even one alligator was seen as the six paddled the canal. The junction to the Grand Prairie was reached at 10:10 AM. The sign indicated that it was five and one-half miles to Monkey Lake which was not nearly as far as expected. The trip is supposed to be nine miles and it did not seem like the group had paddled three and a half miles that quickly. The boats headed toward Grand Prairie. Joe enjoyed staying far behind the other boats but he could move his kayak in a hurry when he wanted to. About twenty minutes later the group found its first alligator. It was a medium sized beast but it was lying in the marsh totally out of the water. It was a good photo opportunity. There were several wading birds and some hawks. A couple of sandhill cranes flew over a few minutes after the alligator was seen. A least bittern was observed in the grasses. These birds are not usually seen on trips--partly because they are not as plentiful as some of the other birds and partly because they are so well camouflaged. Just before eleven a motor boat approached from the rear. It was a volunteer sent by refuge personnel to break up some of the peat blow-ups that were clogging the trail. It was a nice move by the refuge, but the peat was not such as to cause a lot of paddling difficulty. A snack break happened about 11:30 AM just before reaching Grand Prairie. There were not a lot of signs but the GPS indicated that it was 1.9 crow-fly miles to Monkey Lake. After a relaxing stop the trip continued. A few minutes later another alligator was seen sunning himself in the lily pads. Ev eryone was at the Monkey Lake shelter before one. The shelter was clean and in good repair. After eating lunch it was time to sit around and tell lies. It was a chance to get acquainted with Joe. Some of the men then took the boats out to see the surrounding area. Brown took a spin in Greg’s Magic, Charlie got the chance to paddle Brown’s kayak, and Sam took Charlie’s Prism. No fish were caught, as is usually the case on swamp trips. The King prepared supper. It consisted of fried chicken, salad, instant potatoes, and rolls. Since Charlie dirtied the dishes he was graciously permitted to wash them although Joe disobeyed orders from the King to wash them. He did profusely apologized and was not beheaded. The tents were pitched and the shelter was pretty crowded. Darkness arrives pretty early in mid-October so a lantern was used to light up the place. Intelligent conversation lasted until around eleven but then all six men hit the sack. Joe had asked if there were any bad snorers and was informed that there were no bad snorers but there were some loud ones. It proved true. Charlie got up about daylight and perked a pot of coffee. Once everyone was out of bed Charlie cooked a breakfast modeled after a Roy Moye breakfast entree. It was bulk sausage with peppers, onions, and hash browns with eggs added. The treat was served on flour tortilla shells. All said it was an excellent culinary delight. Brown needed to leave shortly after breakfast because he had to make a trip to Kennsaw. The others were not in such a hurry but had left before ten. The paddle back was pretty much a repeat of the previous day. The weather was still pleasant. The trip ended at Suwannee Canal Recreation Area around one. Everyone wished the others well and went home. It was a good trip.